Since the 29th of December 2013 we have been supporting a local project by the name of ‘Leeds With The Homeless‘. ‘Leeds With The Homeless’ has been in action since Ramadan 2012 and was basically the initiative to share festive foods with the homeless community that may otherwise have gone to waste. Commendably, the group took it one step further, and after the fasting period they continued to bring food for the homeless at the end of every month, hence ‘Leeds With The Homeless’ was born. There are many positive things that could be said about this project which we promise to cover in due course. Of course, the IVA is at pains to raise awareness within faith groups such as ‘Leeds With The Homeless’ (which is primarily Muslim) about the relevance of the plant based diet at this clinical period in time. It is also well within our remit to provide service to any disadvantaged group such as the homeless. 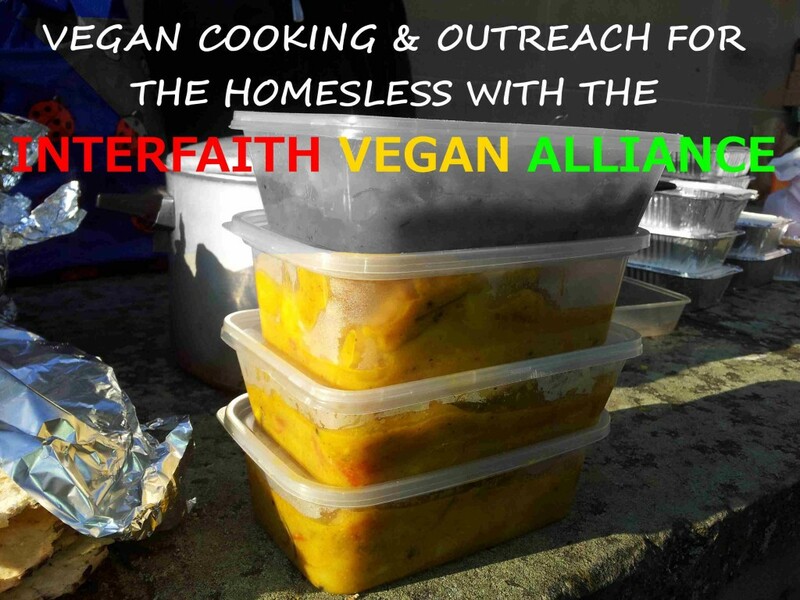 So when the IVA learned about ‘Leeds with the Homeless’ in December 2013, Vegan Cooking for the Homeless was born! This basically involves (1) a small group of volunteers (whether vegan or not) meeting up and putting together some delicious food which is 110% plant based, containing no animal derived substances whatsoever, and there are many reasons for this; and (2) supporting ‘Leeds With The Homeless’ at their event, be it helping set up the buffet, or serving our wonderfully prepared food or any other non-animal derived foods etc. The project leader always groups together his volunteers before food is served and reminds them of what the project is about, he often asks the volunteers to engage with and ‘get to know the homeless’. The IVA has never shied away from this, engaging with the homeless, but equally important, it gives us the opportunity engage with our Muslim brethren about vegetarianism and some relevant Islamic texts. We too are learning. Click here to read more about our homeless outreach. So we are essentially promoting the plant based diet through our service to the homeless, ensuring there are delicious nutritious non-animal derived options available, whilst raising awareness among those we encounter. This also provides a platform for us to; a) extend our work with the homeless, especially along the lines of nutrition and mental health; b) develop similar projects and c) to bring new volunteers on board. Of course, we would not have been able to ‘realise’ this project without a group of committed volunteers and we would like to say thank you to each and every one who has participated in the project. If you or anybody you know is able to donate any plant based foods, especially food that is otherwise destined for the bin, or if able to provide biodegradable containers, plates, cups, or cooking utensils (cutlery, pans, baking trays, serving spoons etc), please get in touch. More info on supporting the alliance here.